BMWs are fun to drive, but when they need repair, it isn't so much fun to try to find a garage service that is qualified and knowledgeable about their unique needs. 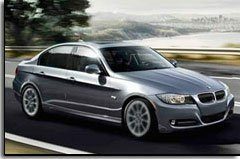 BMW service and repair requires specific training and information typically not available at most repair shops. Waterloo Automotive is a Certified Bosch Service Center which connects us to OE training and information on the sophisticated systems on your BMW. We take great care to make sure our services meet or exceed the requirements by BMW. Our BOSCH Master Tech Keith Young takes great care to make sure our services meet or exceed the requirements by BMW. It takes a different set of mechanics to accomplish your BMW service. They need the proper training and qualifications, which you can find here at Waterloo. Let us handle your BMW service, so that it will be done right the first time. We care as much about your BMW service as you do! Waterloo Service is proud to be able to service BMWs in the Waterloo area. Call today to setup an appointment or use our convenient online appointment scheduler.